Since the 20th century, there have been many exciting achievements in the field of ecology and evolution, many of which were formulated using statistical and mathematical functions. 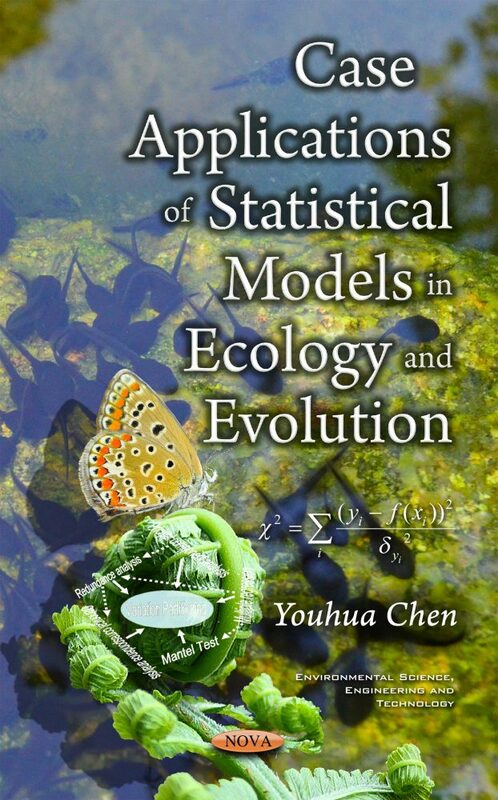 In particular, statistical and mathematical models are a necessity for developing some sub-disciplines and theories like population genetics and ecology, neutral theory of molecular evolution and biodiversity, and machine-learning techniques for species distribution modeling. Borcard, D., and P. Legendre (2012). Is the Mantel correlogram powerful enough to be useful in ecological analysis? A simulation study. Ecology 93, 1473–1481. Crottini, A., J. Brown, V. Mercurio, F. Glaw, M. Vences, and F. Androne (2012). Phylogeography of the poison frog Mantella viridis (Amphibia: Mantellidae) reveals chromatic and genetic differentiation across ecotones in northern Madagascar. J. Zool. Syst. Evol. Res. 50, 305–314. Excoffier, L., and S. Schneider (2005). Arlequin ver. 3.0: An integrated software package for population genetics data analysis. Evol. Bioinform. Online 1, 47–50. Fisher, R. (1921). On the “probable error” of a coefficient of correlation deduced from a small sample. Metron 1, 1–32. Hardle, W., and L. Simar (2012). Applied multivariate statistical analysis, Springer Berlin Heidelberg. Hotelling, H. (1953). New light on the correlation coefficient and its transformation. J. R. Stat. Soc. Ser. B 15, 193–232. Legendre, P., and M. Fortin (2010). Comparison of the Mantel test and alternative approaches for detecting complex multivarite relationships in the spatial analysis of genetic data. Mol. Ecol. Resour. 10, 831–844. Legendre, P., and L. Legendre (1998). Numerical ecology, Elsevier Science BV. Oksanen, J., G. Blanchet, R. Kindt, and et al. (2012). vegan: Community Ecology Package. R package version 2.0-4. R Development Core Team (2013). R: A Language and Environment for Statistical Computing, Vienna, Austria. ISBN 3-900051-07-0, URL http://www.R-project.org. Sokal, R. (1986). Spatial data anlaysis and historical processes, p. 29–43. In E. Diday, Y. Escoufier, L. Lebart, J. Pages, Y. Schektman, and R. Tomassone [eds. ], Data analysis and informatics, IV. North-Holland, Amsterdam, The Netherlands. Wollenberg, K., D. Vieites, F. Glaw, and M. Vences (2011). Speciation in little: the role of range and body size in the diversification of Malagasy mantellid frogs. BCM Evol. Biol. 11, 217. Almeida-Neto M, Frensel D, Ulrich W (2012) Rethinking the relationship between nestedness and beta diversity: a comment on Baselga (2010). Glob Ecol Biogeogr 21:772–777. Almeida-Neto M, Ulrich W (2011) A straightforward computational approach for measuring nestedness using quantitative matrices. Environ Model Softw 26:173–178. Baselga A (2012) The relationship between species replacement, dissimilarity derived from nestedness, and nestedness. Glob Ecol Biogeogr In press. Baselga A (2010) Partitioning the turnover and nestedness components of beta diversity. Glob Ecol Biogeogr 19:134–143. doi: 10.1111/j.1466-8238.2009.00490.x. Baselga, Jimenez-Valverde A, Niccolini G (2007) A multiple-site similarity measure independent of richness. Biol Lett 3:642–645. Carvalho J, Cardoso P, Borges P, et al. (2012a) Measuring fractions of beta diversity and their relationships to nestedness: a theoretical and empirical comparison of novel approaches. Oikos Doi: 10.1111/j.1600–0706.2012.20980.x. doi: 10.1111/j.1600-0706.2012.20980.x. Carvalho J, Cardoso P, Gomes P (2012b) Determining the relative roles of species replacement and species richness differences in generating beta-diversity patterns. Glob Ecol Biogeogr 21:760–771. Condit R, Pitman N, Leigh EG, et al. (2002) Beta-diversity in tropical forest trees. Science (80-) 295:666–9. Crowe T, Frost N, Hawkins S (2011) Interactive effects of losing key grazers and ecosystem engineers vary with environmental context. Mar Ecol Prog Ser 430:223–234. Gotelli N, Ulrich W (2010) The empirical Bayes approach as a tool to identify non-random species associations. Oecologia 162:463–477. Larsen T, Williams N, Kremen C (2005) Extinction order and altered community structure rapidly disrupt ecosystem functioning. Ecol Lett 8:538–547. Podani J, Shmera D (2012) A comparative evaluation of pairwise nestedness measures. Ecography (Cop). doi: 10.1111/j.1600-0587.2011.07319.x. Pongsiri M, Roan J, Ezenwa V, et al. (2009) Biodiversity loss affects global disease ecology. Bioscience 59:945–954. Schmera D, Podani J (2011) Comments on separating components of beta diversity. Community Ecol 12:153–160. Ulrich W, Gotelli N (2007) Null model analysis of species nestedness patterns. Ecology 88:1824–1831. Borcard D, Legendre P, Drapeau P (1992) Partialling out the Spatial Component of Ecological Variation. Ecology 73:1045. Dimitriadis C, Koutsoubas D (2011) Functional diversity and species turnover of benthic invertebrates along a local environmental gradient induced by an aquaculture unit: the contribution of species dispersal ability and rarity. Hydrobiologia 670:307–315. Diserud O, Ødegaard F (2007) A multiple-site similarity measure. Biol Lett 3:20–22. Gaston K (1994) Rarity. Chapman and Hall, London. He F, Hubbell S (2011) Species–area relationships always overestimate extinction rates from habitat loss. Nature 473:368–371. Kraft NJB, Comita LS, Chase JM, et al. (2011) Disentangling the drivers of β diversity along latitudinal and elevational gradients. Science 333:1755–8. doi: 10.1126/science.1208584. Legendre P (2007) Studying beta diversity: ecological variation partitioning by multiple regression and canonical analysis. J Plant Ecol 1:3–8. Legendre P, Borcard D, Peres-Neto P (2008) Analyzing or explaining beta diversity : Comment. Ecology 3238–3244. Legendre P, Borcard D, Peres-Neto P (2005) Analyzing beta diversity: Partitioning the spatial variation of community composition data. Ecol Monogr 75:435–450. Legendre P, Legendre L (1998) Numerical ecology. Elsevier Science BV, Amsterdam. Legendre P, Mi X, Ren H, et al. (2009) Partitioning beta diversity in a subtropical broad-leaved forest of China. Ecology 90:663–674. Mi X, Swenson NG, Valencia R, et al. (2012) The Contribution of Rare Species to Community Phylogenetic Diversity across a Global Network of Forest Plots. Am Nat 180:E17–30. doi: 10.1086/665999. Peres-Neto P, Legendre P, Dray S, Borcard D (2006) Variation partitioning of species data matrices: estimation and comparison of fractions. Ecology 87:2614–2625. Ricotta C, Heathfield D, Godefroid, Mazzoleni S (2012) The effects of habitat filtering on the phylogenetic structure of the urban flora of Brussels (Belgium). Community Eol 13:97–101. Ruokolainen K, Tuomisto H (2002) Beta-diversity in tropical forests. Science 297:1439; discussion 1439. doi: 10.1126/science.297.5586.1439a. Smith TW, Lundholm JT (2010) Variation partitioning as a tool to distinguish between niche and neutral processes. Ecography (Cop) 33:648–655. doi: 10.1111/j.1600-0587.2009.06105.x. Tuomisto H, Ruokolainen K (2006) Analyzing or explaining beta diversity? Understanding the targets of different methods of analysis. Ecology 87:2697–708. Tuomisto H, Ruokolainen L, Ruokolainen K (2012) Modelling niche and neutral dynamics: on the ecological interpretation of variation partitioning results. Ecography (Cop) no–no. doi: 10.1111/j.1600-0587.2012.07339.x. Whittaker R (1972) Evolution and measurement of species diversity. Taxon 21:213–351. Williams P, Gibbons D, Margules C, et al. (1996) A comparison of richness hotspots, rarity hotspots, and complementary areas for conserving diversity of British birds. Conserv Biol 10:155–174. Borcard D, Legendre P (2002) All-scale spatial analysis of ecological data by means of principal coordinates of neighbor matrices. Ecol Modell 153:51–68. Borcard D, Legendre P (1994) Environmental control and spatial structure in ecological communities: an example using oribatid mites (Acari, Oribatei). Environ Ecol Stat 1:37–61. ter Braak CJF (1986) Canonical correspondence analysis : a new eigenvector technique for multivariate direct gradient analysis. Ecology 67:1167–1179. Cushman S, McGarigal K (2002) Hierarchical, multi-scale decomposition ofspecies-environment relationships. Landsc Ecol 17:637–646. Diniz-Filho J, Siqueira T, Padial A, et al. (2012) Spatial atucorrelation analysis allows disentangling the balance between neutral and niche processes in metacommunities. Oikos 121:201–210. Dray S, Legendre P, Peres-Neto PR (2006) Spatial modelling: a comprehensive framework for principal coordinate analysis of neighbour matrices (PCNM). Ecol Modell 196:483–493. Gilbert B, Bennett JR (2010) Partitioning variation in ecological communities: do the numbers add up? J Appl Ecol 47:1071–1082. doi: 10.1111/j.1365-2664.2010.01861.x. Gilbert B, Lechowicz M (2004) Neutrality, niches, and dispersal in a temperate forest understory. Proc Natl Acad Sci 101:7651–7656. Gilbert B, Srivastava DS, Kirby KR (2008) Niche partitioning at multiple scales facilitates coexistence among mosquito larvae. Oikos 117:944–950. Gotelli N, McGill B (2006) Null versus neutral models: what’s the difference? Ecography (Cop) 29:793–800. Hubbell SP (2001) The Unified Neutral Theory of Biodiversity and Biogeography (MPB-32) (Monographs in Population Biology). Princeton University Press. Jones M, Tuomisto H, Borcard D, et al. (2008) Explaining variation in tropical plant community composition: influence of environmental and spatial data quality. Oecologica 155:593–604. Lindo Z, Winchester NN (2009) Spatial and environmental factors contributing to patterns in arboreal and terrestrial oribatid mite diversity across spatial scales. Oecologia 160:817–25. McGill B (2003) A test of the unified neutral theory of biodiversity. Nature 422:881–885. Oksanen J, Blanchet F, Kindt R, et al. (2012) vegan: Community Ecology Package. R package version 2.0-4. http://CRAN.R-project.org/package =vegan. Pearman P (2002) The scale of community structure: habitat variation and avian guids in tropical forest understory. Ecol Monogr 72:19–39. Peltonen H, Luoto M, Pakkonen J, et al. (2007) Pelagic fish abundance in relation to regional environmental variation in the Gulf of Finland, northern Baltic Sea. ICES J Mar Sci 64:487–495. Sattler T, Borcard D, Arlettaz R, et al. (2010) Spider, bee, and bird communities in cities are shaped by environmental control and high stochasticity. Ecology 91:3343–3353. Smith TW, Lundholm JT (2010) Variation partitioning as a tool to distinguish between niche and neutral processes. Ecography (Cop) 33:648–655. doi: 10.1111/j.1600-0587. 2009.06105.x. Steward-Koster B, Kennard M, Harch B, et al. (2007) Partitioning the variation in stream fish assemblages within a spatio-temporal hierarchy. Mar Freshw Res 58:675–686. Tibshirani R (1996) Regression shrinkage and selection via the Lasso. J R Stat Soc B 58:267–288. Bremer K (1992) Ancestral areas: a cladistic reinterpretation of centre of origin concept. Syst. Biol. 41:436–445. Donoghue M, Moore B (2003) Toward an integrative historical biogeography. Integr. Comp. Biol. 43:261–270. Felsenstein J (2004) Inferring phylogenies. Sinauer Associates, Sunderland MA. Goldberg E, Lancaster L, Ree R (2011) Phylogenetic inference of reciprocal effects between geographic range evolution and diversification. Syst. Biol. 60:451–565. Harris A, Xiang Q (2009) Estimating ancestral distributions of lineages with uncertain sister groups: a statistical approach to dispersal-vicariance analysis and a case using Aesculus L. (Sapindaceae) including fossils. J. Syst. Evol. 47:349–368. Hausdorf B (1998) Weighted ancestral area analysis and solution of the redundant distribution problem. Syst. Biol. 47:445–456. Lamm K, Redelings B (2009) Reconstructing ancestral ranges in historical biogeography: properties and prospects. J. Syst. Evol. 47:369–382. Maddison W, Midford P, Otto S (2007) Estimating a binary character’s effect on speciation and extinction. Syst. Biol. 56:701–710. Nepokroeff M, Sytsma K, Wagner W, Zimmer E (2003) Reconstructing ancestral patterns of colonization and dispersal in the Hawaiian understory tree genus Psychotria (Rubiaceae): A comparison of parsimony and likelihood approaches. 2Systematic Biol. 52:820–838. Nylander J, Olsson U, Alstrom P, Sanmartin I (2008) Accounting for phylogenetic uncertainty in biogeography: a bayesian approach to dispersal-vicariance anaysis of the Thurshes (Aves: Turdus). Syst. Biol. 57:257–268. Ree R, Moore B, Webb C, Donoghue M (2005) A likelihood framework for inferring the evolution of geogrpahic range on phylogenetic trees. Evolution (N. Y). 59:2299–2311. Ree R, Smith S (2008) Maximum likelihood inference of geographic range evolution by dispersal, local extinction and cladogenesis. Syst. Biol. 57:4–14. Ronquist F (1994) Ancestral Areas and Parsimony. Syst. Biol. 43:267–274. Ronquist F (1997) Dispersal-Vicariance Analysis: A New Approach to the Quantification of Historical Biogeography. Syst. Biol. 46:195–203. Sanmartín I, Anderson CL, Alarcon M, Ronquist F, Aldasoro JJ (2010) Bayesian island biogeography in a continental setting: the Rand Flora case. Biol. Lett. 6:703–7. Sanmartin I, Mark P Van der, Ronquist F (2008) Inferring dispersal: a Bayesian approach to phylogeny-based island biogeogarphy, with special reference to the Canary Islands. J. Biogeogr. 35:438–449. Tavaré S (1986) Some Probabilistic and Statistical Problems in the Analysis of DNA Sequences. Lect. Math. Life Sci. American Math. Soc. 17:57–86. Yu Y, Harris A, He X (2010) S-DIVA (statistical dispersal-vicariance analysis): a tool for inferring biogeographic histories. Mol. Phylogenet. Evol. 56:848–850. Belmaker J, Jetz W (2012) Regional pools and environmental controls of vertebrate assemblages. Am. Nat. 179:512–523. Bininda-Emonds O, Cardillo M, Jones K, MacPhee R, Beck R, Grenyer R, Price S, Vos A, Gittleman J, Purivs A (2007) The delayed rise of present-day mammals. Nature 446:507–512. Cooper N, Freckleton RP, Jetz W (2011) Phylogenetic conservatism of environmental niches in mammals. Proc. R. Soc. B Biol. Sci. 278:2384–91. Davies T, Buckley L (2012) Exploring the phylogenetic history of mammal species richness. Glob. Ecol. Biogeogr. 21:1096–1105. Etienne R, Visser S de, Janzen T, Olsen J, Olff H, Rosindell J (2012) Can clade age alone explain the relationship between body size and diversity? Interface Focus 2:170–179. Grenyer R, Orme CDL, Jackson SF, Thomas GH, Davies RG, Davies TJ, Jones KE, Olson VA, Ridgely RS, Rasmussen PC, Ding T-S, Bennett PM, Blackburn TM, Gaston KJ, Gittleman JL, Owens IPF (2006) Global distribution and conservation of rare and threatened vertebrates. Nature 444:93–6. Jetz W, Fine P (2012) Global gradients in vertebrate diversity predicted by historical area-productivity dynamics and contemporary environment. PLoS Biol. 10:e1001292. McPeek M, Brown J (2007) Clade age and not diversification rate explains species richenss among animal taxa. Am. Nat. 169:E97–106. Rabosky D (2006a) Likelihood methods for detecting temporal shifts in diversification rates. Evolution (N. Y). 60:1152–1164. Rabosky D (2006b) LASER: a maximum likelihood toolkit for detecting temporal shifts in diversification rates from molecular phylogenies. Evol. Bioinform. Online 2:247–250. Rabosky DL (2009) Ecological limits and diversification rate: alternative paradigms to explain the variation in species richness among clades and regions. Ecol. Lett. 12:735–43. Rabosky D, Adams D (2012) Rates of morphological evolution are correlated with species richness in salamanders. Evolution (N. Y). 66:1807–1818. Rabosky D, Lovette I (2008a) Density dependent diversification in North American wood-warblers. Proc. R. Soc. B Biol. Sci. 275:2363–2371. Rabosky D, Lovette I (2008b) Explosive evolutionary radiations: decreasing speciation or increasing extinction through time? Evolution (N. Y). 62:1866–1875. Rabosky D, Slater G, Alfaro M (2012) Clade Age and Species Richness Are Decoupled Across the Eukaryotic Tree of Life. PLoS Biol. 10:e1001381. Safi K, Cianciaruso M, Loyola R, Brito D, Armour-Marshall K, Diniz-Filho J (2011) Understanding global patterns of mammalian functional and phylogenetic diversity. Philos. Trans. R. Soc. B 366:2536–2544. Avery R (1999) A concise history of Philadelphia. Otis Books. Baddeley A, Turner R (2005) Spatstat: an R package for analyzing spatial point patterns. J. Stat. Softw. 12:1–42. Barra Foundation (1982) Philadelphia: a 300-year history. Barra Foundation. Cheng Y (2012) Research methods of ancient Chinese cities site selection. Collect. Essays Chinese Hist. Geogr. 27:84–93. Diggle P (2003) Statistical analysis of spatial point patterns. Academic Press, London, UK. Eckel SM (2008) Statistical Analysis of Spatial Point Patterns: Applications to Economical, Biomedical and Ecological Data. Goldewijk K (2001) Estimating global land use change over the past 300 years: the HYDE database. Global Biogeochem. Cycles 15:417–433. Gray L, He F (2009) Spatial point-pattern analyssi for detecting density-dependent competition in a boreal chronosequence of Alberta. For. Ecol. Manage. 259:98–106. Han M, Hou J, Wu L (1995) Potential impacts of sea-level rise on China’s coastal environment and cities: a national assessment. J. Coast. Resarch 14:79–95. Homberger E, Hudson A (2005) The historical atlas of New York City: a visual celebration of 400 years of new york city’s history. Owl Books. Hou R (1979) The study of urban historical geography and city planning. Acta Geogr. Sin. 34:315–328. Kojima R (1995) Urbanization in China. Dev. Econ. 33:151–154. Lepers E, Lambin E, Janetos A, DeFries R, Achard F, Ramankutty N, Scholes R (2005) A synthesis of information on rapid land-cover change for the period 1981-2000. Bioscience 55:115–124. Li M (2010) Essential factor analysis to the site selection for the administration center of the minority area. Asian Soc. Sci. 6:24–27. Li B, Fang X, Ye Y, Zhang X (2010) Accuracy assessment of global historical cropland datasets based on regional reconstructed historical data-A case study in Northeast China. Sci. China Earth Sci. 53:1689–1699. McKinsey Global Institute (2009) Preparing for China’s urban billion. R Development Core Team (2013) R: A Language and Environment for Statistical Computing, Vienna, Austria. ISBN 3-900051-07-0, URL http://www.R-project.org. Ramankutty N, Foley J (1999) Estimating historical changes in global land cover: croplands from 1700 to 1992. Global Biogeochem. Cycles 13:997–1027. Shen G, He F, Waagepetersen R, Sun I, Hao Z, Chen Z, Yu M (2013) Quantifying effects of habitat heterogeneity and other clustering processes on spatial distributions of tree species. Ecology:In press. Shen G, Yu M, Hu X, Mi X, Ren H, Sun I, Ma K (2009) Species-area relationships explained by the joint effects of dispersal limitation and habitat heterogeneity. Ecology 90:3033–3041. Zhou L, Dickinson R, Tian Y, Fang J, Li Q, Kaufmann R, Tucker C, Myneni R (2004) Evidence for a significant urbanization effect on climate in China. PNAS 101:9540–9544. Zhu Y (2012) Environmental impacts of rapid urbanization in China: a showcase of recent research developments. Environ. Sci. Pollut. Res. 19:1351. Zhu Y, Ioannidis J, Li H, Jones K, Martin F (2011) Understanding and hamessing the health effects of rapid urbanization in China. Environ. Sci. Technol. 45:5099–5104. Arrhenius O (1921) Species and area. J Ecol 9:95–99. Borges P, Hortal J, Gabriel R, Homem N (2009) Would species richness estimators change the observed species area relationship? Acta Oecologica 35:149–156. Cameron R, Triantis K, Parent C, et al. (2013) Snails on oceanic islands: testing the general dynamic model of oceanic island biogeography using linear mixed effect models. J Biogeogr 40:117–130. Chase J, Knight T (2013) Scale-dependent effect sizes of ecological drivers on biodiversity: why standardised sampling is not enough. Ecol Lett 16:17–26. Chen Y (2009) Combining the species-area-habitat relationship and environmental cluster analysis to set conservation priorities: a study in the Zhoushan Archipelago, China. Conserv Biol 23:537–545. Colwell R (2006) EstimateS: statistical estimation of species richness and shared species from samples. Version 8. Colwell R, Coddington J (1994) Estimating terrestrial biodiversity through extrapolation. Philos Trans R Soc Lond B Biol Sci 345:101–118. Cressie N, Calder C, Clark J, et al. (2009) Accounting for uncertainty in ecological analysis: the strengths and limitations of hierarchical statistical modeling. Ecol Appl 19:553–570. Falk M (2010) Incorporating uncertainty in environmental models informed by imagery. PhD thesis, Queensland University of Technology. Fattorini S (2009) Darkling beetle communities in two geologically contrasting biotopes: testing biodiversity patterns by microsite comparisons. Biol J Linn Soc 98:787–793. Gotelli N, Colwell R (2001) Quantifying biodiversity: procedures and pitfalls in the measurement and comparison of species richness. Ecol Lett 4:379–391. Halley J, Sgardeli V, Monokrousos N (2013) Species-area relationships and extinction forecasts. Ann N Y Acad Sci 1286:50–61. He F, Hubbell S (2012) Geometry and scale in species-area relationshps; Extinction and climate change: a reply. Nature 482:E5–E6. He F, Hubbell S (2013) Estimating extinction from species-area relationships: why the numbers do not add up? Ecology In press. He F, Legendre P (1996) On species-area relations. Am Nat 148:719–737. Hortal J (2012) Escaping the trap of low sample size in island biogeography. Front Biogeogr 3:4. Hortal J, Borges P, Gaspar C (2006) Evaluating the performance of species richness estimators: sensitivity to sample grain size. J Anim Ecol 75:274–287. Hortal J, Triantis K, Meiri S, et al. (2009) Island species richness increases with habitat diversity. Am Nat 174:E205–E217. Hu G, Wu J, Feeley K, et al. (2012) The effects of landscape variables on the species-area relationship during late-stage habitat fragmentation. PLoS One 7:e43894. Hui D, Jackson R (2007) Uncertainty in allometric exponent estimation: a case study in scaling metabolic rate with body mass. J Theor Biol 249:168–177. Jager H, King A (2004) Spatial uncertainty and ecological models. Ecosystems 7:841–847. Kinzig A, Harte J (2000) Implications of endemics-area relationships for estimates of species extinctions. Ecology 81:3305–3311. Kolasa J, Manne L, Pandit S (2012) Species-area relationships arise from interaction of habitat heterogeneity and species pool. Hydrobiologia 685:135–144. Ma Y (2008) Variable cosmological constant model: the reconstruction equations and constraints from current observational data. Nucl Phys B 804:262–285. Moore J, Semmens B (2008) Incorporating uncertainty and prior information into stable isotope mixing models. Ecol Lett 11:470–480. Packard G (2009) On the use of logarithmic transformations in allometric analyses. J Theor Biol 257:515–518. Packard G (2013) Is logarithmic transformation necessary in allometry? Biol J Linn Soc DOI: 10.1111/bij.12038. Patino J, Guilhaumon F, Whittaker R, et al. (2013) Accounting for data heterogeneity in patterns of biodiversity: an application of linear mixed effect model to the oceanic island biogeography of spore-producing plants. Ecography (Cop) In press. Phillips D, Gregg J (2001) Uncertainty in source partitioning using stable isotopes. Oecologia 127:171–179. Sfenthourakis S, Triantis K (2009) Habitat diversity, ecological requirements of species, and the small island effect. Divers Distrib 15:131–140. Shen G, Yu M, Hu X, et al. (2009) Species-area relationships explained by the joint effects of dispersal limitation and habitat heterogeneity. Ecology 90:3033–3041. Triantis K, Mylonas M, Whittaker R (2008) Evolutionary species-area curves as revealed by single-island endemics: insights for the interprovincial species-area relationship. Ecography (Cop) 31:401–407. Wang Y, Zhang M, Wang S, et al. (2012) No evidence for the small island effect in avian communities on islands of an inundated lake. Oikos 121:1945–1952. Xiao X, White E, Hooten M, Durham S (2011) On the use of log-transformation vs. nonlinear regression for analyzing biological power laws. Ecology 92:1887–1894. Blackburn T, Cassey P, Gaston K (2006) Variations on a theme: sources of heterogeneity in the form of the interspecific relationship between abundance and distribution. J. Anim. Ecol. 75:1426–1439. Chen Y, Bi J (2007) Biogeography and hotspots of amphibian species of China: implications to reserve selection and conservation. Curr. Sci. 92:480–489. Dormann C (2007) Effects of incorporating spatial autocoorrelation into the analysis of species distribution data. Glob. Ecol. Biogeogr. 16:129–138. Elith J, Graham C, Aderson R,. (2006) Novel methods improve prediction of species’ distributions from occurrence data. Ecography (Cop.). 29:129–151. Elith J, Phillips S, Hastie T, Dudik M, Chee Y, Yates C (2011) A statistical explanation of MaxTent for ecologists. Divers. Distrib. 17:43–57. Fei L, Ye C, Jiang J (2010) Progress and prospects for studies on Chinese amphibians. Asian Herpetol. Res. 1:64–85. Figueiredo M, Grelle C (2009) Predicting global abundance of a threatened species from its occurrence: implications for conservation planning. Divers. Distrib. 15:117–121. Frisk M, Duplisea D, Trenkel V (2011) Exploring the abundance-occupancy relationships for the Georges Bank finfish and shellfish community from 1963 to 2006. Ecol. Appl. 21:227–240. Gaston K (1996) The multiple forms of the interspecific abundance–distribution relationship. Oikos 76:211–220. Gaston KJ, Blackburn TM, Greenwood JJD, Gregory RD, Quinn RM, Lawton JH (2000) Abundance–occupancy relationships. J. Appl. Ecol. 37:39–59. Hawlitschk O, Porch N, Hendrich L, Balke M (2011) Ecological Niche Modelling and nDNA Sequencing Support a New, Morphologically Cryptic Beetle Species Unveiled by DNA Barcoding. PLoS One 6:e16662. He F (2012) Area-based assessment of extinction risk. Ecology 93:974–980. He F, Gaston K (2000) Estimating species abundance form occurrence. Am. Nat. 156:553–559. He F, Gaston K (2007) Estimating abundance from occurrence: an underdetermined problem. Am. Nat. 170:655–659. He F, Gston K, Wu J (2002) On species occupancy-abundance models. Ecoscience 9:119–126. Hui C, Boonzaaier C, Boyero L (2012) Estimating changes in species abundance from occupancy and aggregation. Basic Appl. Ecol. 13:169–177. Hurlbert A, White E (2007) Ecological correlates of geographical range occupancy in North American birds. Glob. Ecol. Biogeogr. 16:764–773. Legendre P (1993) Spatial autocorrelation: trouble or new paradigm? Ecology 74:1659–1673. Legendre P, Borcard D, Peres-Neto P (2005) Analyzing beta diversity: Partitioning the spatial variation of community composition data. Ecol. Monogr. 75:435–450. Legendre P, Borcard D, Peres-Neto P (2008) Analyzing or explaining beta diversity: Comment. Ecology: 3238–3244. Liu H, Wang W, Song G, Qu Y, Li S, Fjeldsa J, Lei F (2012) Interpreting the process behind endemism in China by integrating the phylogeography and ecological niche models of the Stachyridopsis ruficeps. PLoS One 7:e46761. López-Cárdenas J, Gonzalez Bravo FE, Salazar Schettino PM, Gallaga Solorzano JC, Ramírez Barba E, Martinez Mendez J, Sánchez-Cordero V, Peterson AT, Ramsey JM (2005) Fine-scale predictions of distributions of Chagas disease vectors in the state of Guanajuato, Mexico. J. Med. Entomol. 42:1068–81. Maclean I, Wilson R, Hassall M (2011) Predicting changes in the abundance of African wetland birds by incorporating abundance-occupancy relationships into habitat association models. Divers. Distrib. 17:480–490. Medley K (2010) Niche shifts during the global invasion of the Asian tiger mosquito, Aedes albopictus Skuse (Culicidae), revealed by reciprocal distribution models. Glob. Ecol. Biogeogr. 19:122–133. Peterson AT, Sánchez-Cordero V, Beard C Ben, Ramsey JM (2002) Ecologic niche modeling and potential reservoirs for Chagas disease, Mexico. Emerg. Infect. Dis. 8:662–7. Peterson A, Vieglais D (2001) Predicting species invasions using ecological niche modeling: new approaches from bioinformatics attack a pressing problem. Bio Science 2 51:363–371. Petitpierre B, Kueffer C, Broennimann O, Randin C, Daehler C, Guisan A (2012) Climatic niche shifts are rare among terrestrial plant invaders. Science (80-.). 335:1344–1348. Phillips S, Anderson R, Schapire R (2006) Maximum entropy modeling of species geographic distributions. Ecol. Modell. 190:231–259. Phillips S, Dudik M, Schapire R (2004) A maximum entropy approach to species distribution modeling. In: Brodley C, Cavazos J, Chan P, Jacob N, Kak A, Lippman R, Moss E, Pavlopoulou C, Precup D, Scheeff D, Stefanovic D, Utgoff P, Yurcik B (eds.) Proc. 21st Int. Conf. Mach. Learn. ACM Press, New York, pp. 655–662. Qian H (2010) Environment-richness relationships for mammals, birds, reptiles and amphibians at global and regional scales. Ecol. Res. 25:629–637. Qian H, Wang X, Wang S, Li Y (2007) Environmental determinants of amphibian and reptile species richness in China. Ecography (Cop.). 30:471–482. Raxworthy C, Ingram C, Rabibisoa N, Pearson R (2007) Applications of ecological niche modeling for species delimitation: a review and empirical evaluation using day geckos (Phelsuma) from Madagascar. Syst. Biol. 56:907–923. Reeves P, Richards C (2011) Species delimitation under the general lineage concept: an empirical example using wild North American hops (Cannabaceae: Humulus lupulus). Syst. Biol. 60:45–59. Rodder D, Schmidtlein S, Veith M, Lotters S (2009) Alien invasive slider turtle in unpredicted habitat: a matter of niche shift or of predictors studied? PLoS One 4:e7843. Soberon J, Peterson A (2011) Ecological niche shifts and environmental space anisotropy: a cautionary note. Rev. Mex. Biodivers. 82:1348–1355. Urbina-Cardona J, Flores-Villela O (2010) Ecological-niche modeling and priortization of conservation-area networks for Mexican herpetofauna. Conserv. Biol. 24:1031–1041. Venette R, Kriticos D, Magarey R, Koch F, Baker R, Worner S, Raboteaux N, McKenney D, Dobesberger E, Yemshanov D, Barro P, Hutchison M, Fowler G, Kalaris T, Pedlar J (2010) Pest risk maps for invasive alien species: a roadmap for improvement. Bioscience 60:349–362. Wake D (1991) Declining amphibian populations. Science (80-.). 253:860. Wake D (2007) Climate change implicated in amphibian and lizard declines. Proc. Natl. Acad. Sci. United States Am. 104:8201–8202. Webb T, Freckleton R, Gaston K (2012) Characterizing abundance-occupancy relationships: there is no artefect. Glob. Ecol. Biogeogr. 21:952–957. Wilson P (2011) The consequences of using different measures of mean abundance to characterize the abundance–occupancy relationship. Glob. Ecol. Biogeogr. 20:193–202. Xie F, Lau M, Staurt S, Chanson J, Cox N, Fischman D (2007) Conservation needs of amphibians in China: a review. Sci. China Ser. C Life Sci. 50:265–276. Bascompte J, Jordano P, Olesen J (2006) Asymmetric coevolutionary netowrks facilitate biodiversity maintenance. Science (80-) 312:431–433. Cheeson P (1994) Multispecies competition in variable environments. Theor Popul Biol 45:227–276. Chesson P (2000) Mechanisms of maintence of species diversity. Annu Rev Ecol Syst 31:343–366. Chesson P, Neuhauser C (2002) Intraspecific aggregation and species coexistence. Trends Ecol Evol 17:210–211. Salomon Y, Connolly SR, Bode L (2010) Effects of asymmetric dispersal on the coexistence of competing species. Ecol Lett 13:432–41. doi: 10.1111/j.1461-0248.2009.01436.x. Beger M, Linke S, Watts M, Game E, Treml E, Ball I, Possingham HP (2010) Incorporating asymmetric connectivity into spatial decision making for conservation. Conservation Letters, 3, 359-368. Berkley HA, Kendall BE, Mitarai S, Siegel DA (2010) Turbulent dispersal promotes species coexistence. Ecology Letters, 13, 360-371. Bode M, Burrage K, Possingham HP (2008) Using complex network metrices to predict the persistence of metapopulations with asymmetric connectivity patterns. Ecological Modelling, 214, 201-209. Chesson P (1990) MacArthur's consumer-resource model. Theoretical population biology, 37, 26-38. Chisholm RA, Filotas E (2009) Critical slowing down as an indicator of transitions in two-species models. Journal of Theoretical Biology, 257, 142-149. Chisholm RA, Pacala SW. 2010. Niche and neutral models predict asymptotically equivalent species abundance distributions in high-diversity ecological communities. Proceedings of the National Academy of Sciences 107(36): 15821-15825. Chisholm RA, Pacala SW. 2011. Independent species in independent niches behave neutrally: A response. Oikos 120(7): 964-965. Cushing JM, Levarge S, Chitnis N, Henson SM (2004) Some discrete competition models and the competitive exclusion principle. Journal of Difference Equations and Applications, 10, 1139-1151. Grez AA, Gonzalez RH (1995) Resource concentration hypothesis: effect of host plant patch size on density of herbivorous insects. Oecologia, 103, 471-474. Hall SR, Becker CR, Simonis JL, Duffy MA, Tessier AJ, Caceres CE (2009) Friendly competition: evidence for a dilution effect among competitors in a planktonic host-parasite system. Ecology, 90, 791-801. Holland, J.N. and D.L. DeAngelis. 2010. A consumer-resource approach to the density-dependent population dynamics of mutualism. Ecology 91:1286-1295. Holland JN, DeAngelis DL (2009) Consumer-resource theory predicts dynamic transitions between outcomes of interspecific interactions. Ecology Letters, 12, 1357-1366. Hubbell SP (2001) The unified neutral theory of biodiversity and biogeography. Princeton University Press, Princeton. Hubbell SP (2006) Neutral theory and the evolution of ecological equivalence. Ecology, 87, 1387-1398. Morozov A, Petrovskii S (2009) Excitable population dynamics, biological control failure, and spatiotemporal pattern formation in a model ecosystem. Bulletin of Mathematical Biology, 71, 863-887. Ngoc DN, Parra RB, Zavala MA, Auger P (2010) Competition and species coexistence in a metapopulation model: can fast dispersal reverse the outcome of competition in a homogeneous environment? Journal of Theoretical Biology, 266, 256-263. Otway SJ, Hector A, Lawton JH (2005) Resource dilution effects on specialist insect herbivores in a grassland biodiversity experiment. Journal of Animal Ecology, 74, 234-240. Potthoff M, Johst K, Gutt J, Wissel C (2006) Clumped dispersal and species coexistence. Ecological Modelling, 198, 247-254. Root RB (1973) Organization of a plant-arthropod association in simple and diverse habitats: the fauna of collards (Brassica oleracea). Ecological Monographs, 43, 95-124. Rosindell J, Hubbell SP, Etienne R (2011) The unified neutral theory of biodiversity and biogeography at age ten. Trends in Ecology and Evolution, 26, 340-348. Salomon Y, Connolly SR, Bode L (2010) Effects of asymmetric dispersal on the coexistence of competing species. Ecology Letters, 13, 432-441. Snyder RE, Chesson P (2003) Local dispersal can facilitate coexistence in the presence of permanent spatial heterogeneity. Ecology Letters, 6, 301–309. Vuilleumier S, Possingham HP (2006) Dose colonization asymmetry matter in metapopulations? Proceedings of the Royal Society B: Biological Sciences, 273, 1637-1642. Yu DW, WiLSON hb, Frederickson ME, Palomino W, Colina RDL, Edwards DP (2004) Experimental demonstration of species coexistence enabled by dispersal limitation. Journal of Animal Ecology, 73, 1102-1114. Zhou SR, Zhang DY (2006) Neutral theory in community ecology. Journal of Plant Ecology, 30, 8680-877.